I kept it alive to noodles entirely without a fault of the organic wheat of the high quality being to saw it, and to just use powder, and abandoning wheat original taste. The simplicity of the noodles which changed color slightly is the proof. 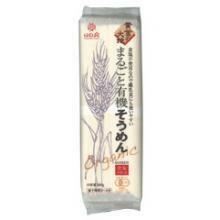 In addition, I usually use salt at the time of production, but am the dried noodles which do not use salt. In addition, win without artificial manure and a pesticide for three years, and the raw materials grow up from soil and are dried noodles of the Ministry of Agriculture, Forestry and Fisheries "organic JAS" using the wheat made of "the organic farmings" that are kind to environment authorization.